Most every Thursday, GM updates Corvette model, option and/or color constraints. Thanks To Mike Furman atCriswell Chevrolet, who has volunteered to weekly update date on all changes, this thread will be updated every Thursday. We will add that new information in a subsequent post here. Mike can be reached, desk direct @: 301.212.4420. To get the best deals at Criswell, please only and directly talk with Mike Furman, especially as he is the only one there with 40 years Corvette ordering experience and thus he has detailed knowledge of Corvette specifications. He is therefore uniquely, by Criswell’s owner, authorized to give you the best pricing; and also consequently, he has the greatest knowledge to help you pick your way though the ten pages of factory ordering choices, to get you the exact options you want on your C7. Here is your constraints updated as of Thursday, July 5th: On that date, they will be posted here (testing ahead of then to insure "post reply" functionality). Mike can be reached, desk direct @: 301.212.4420. To get the best deals at Criswell, please only and directly talk with Mike Furman, especially as he is the only one there with 40 years Corvette ordering experience. He consequently has detailed knowledge of Corvette specifications. He is therefore uniquely, by Criswell’s owner, authorized to give you the best pricing. Moreover, because of that experience, and his long term personal ownership of Corvettes going back to his 1959, has the greatest knowledge to help you pick your way though the ten pages of factory ordering choices, to get you the exact options you want on your C7. Here are your consensus ordering constraints thanks to Mike@Criswell. 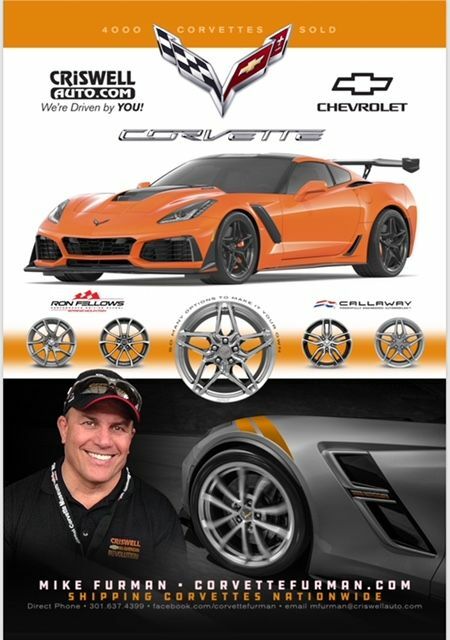 Mike will be sharing them with us here every week — critical iniformation for those of you ordering a new Corvette. Thank you Mike. Mike Furman can be reached, desk direct @: 301.212.4420. To get the best deals at Criswell, please only and directly talk with Mike Furman, especially as he is the only one there with 40 years Corvette ordering experience and thus he has detailed knowledge of Corvette specifications. He is therefore uniquely, by Criswell’s owner, authorized to give you the best pricing; and also consequently, he has the greatest knowledge to help you pick your way though the ten pages of factory ordering choices, to get you the exact options you want on your C7. As you can see from below, the year long “controlled allocation” ZR1 continues at it production pace of only 192 being produced each month (the constraint being the ZR1’s gorgeous hand-laid visible carbon fiber for all the car’s exterior CF), and the last few units of Admiral Blue being completed. Every Thursday, the start of the ordering consensus cycle, Mike Furman of Criswell Chevrolet (Mike@Criswell) provides us with the latest constraint information on ordering a new Corvette. This week it is simple, that not a single Corvette, regardless of model, options, color, etc., will be able to be ordered. However, as always, Mike is already working on next week’s orders. He can be reached, desk direct @: 301.212.4420. To get the best deals at Criswell, please only and directly talk with Mike Furman, especially as he is the only one there with 40 years Corvette ordering experience and thus he has detailed knowledge of Corvette specifications. He is therefore uniquely, by Criswell’s owner, authorized to give you the best pricing; and also consequently, he has the greatest knowledge to help you pick your way though the ten pages of factory ordering choices, to get you the exact options you want on your C7. Thank to Mike@Criswell, we have this consensus’ constraints. Bottom line is the same as last week, no allocations for any model. Is the factory “catching up” on those orders it accepted in the Spring? Probably, and probably we will see the ordering banks again open this coming Thursday. Shadow Gray remains “on hold” unti August 30th — the announced date when orders for that color will begin. Last edited by John; 07-28-2018, 10:29 PM. Surprising, that no allocations again this week. We learned this from Mike Furman@Criswell Chevrolet. This is the fourth week in a row, so maybe something is going on within the Plant??? Inquiring minds want to know. keeping a balance of supply and demand in the beginning of last year? Thank you Mike Furman for today’s 2019 Corvette constraint consensus updates. Bottom line, for the 5th week in a row, GM is not accepting, at least on paper, any new 2019 orders from its dealers. However, the top forum dealers are getting a few orders picked up sub-Rosa. As seen below, information Mike had heard earlier due to one of his customer’s wanting the BGA “build you own motor” option, we now have written confirmation that this is the very last month for that program (at least for 2019). Specifically Mike learned months ago that to get one of his ZR1 customers the build your own motor option, that customer had to choose an assembly date no later than the week of August 27th. Thank you Mike for again weekly sharing this constraint update information! Last edited by John; 08-09-2018, 08:19 AM. Not heard from Mike, but shared elsewhere, maybe there are some things happening within the Plant that are effecting the very-soon, Powertrain Build Center’s expansion within the Plant? Why would that be? At least we know of the publicly stated info, that Cadillac’s CT6 4.2L, DOHC, 32V, “hot V,” twin turbo motors are going to be built within the PBC. Might there also be some other motors additionally being build within the Plant’s PBC, besides the continuing LT4’s and LT5’s assembly for 2019 Z06’s and ZR1’? Might there be something else new going to be built within an expanded PBC center for what “future potential product”? Again, an oft-repeated, but certainly not yet confirmed rumor. was in it's infancy back then. Thank you Mike Furman for today’s 2019 Corvette constraint consensus updates. Bottom line, for the 6th week in a row, GM is not officially accepting, at least on paper, any new 2019 orders from its dealers. Please see the below chart for today — the start of this week’s consensus. However, the top forum dealers are getting most of their orders picked up due to GM’s policy of rewarding those dealers who, due to their incredible sales levels, have earned those extra allocations. Last edited by John; 08-19-2018, 09:48 AM. Wonder when the regular production resumes? Thank you Mike Furman for today’s 2019 Corvette constraint consensus updates. Bottom line, for the 7th week in a row, GM is not officially accepting, at least on paper, any new 2019 orders from its dealers. However, the top forum dealers are getting most of their orders picked up due to GM’s policy of rewarding those dealers who, due to their incredible sales levels, have earned those extra allocations. However, as always, Mike is already working on next week’s orders. He can be reached, desk direct @: 301.212.4420. To get the best deals at Criswell, please only and directly talk with Mike Furman, especially as he is the only one there with 40 years Corvette ordering experience, and thus he has detailed knowledge of Corvette ordering specifications. He is therefore uniquely, by Criswell’s owner, authorized to give you the best pricing; and also consequently, he has the greatest knowledge to help you pick your way though the ten pages of factory ordering choices, to get you the exact options you want on your C7. Last edited by John; 08-30-2018, 03:53 PM.